San Antonio, Texas in April. I thought, how lucky can I be to get to go on a business trip (with golf) in April. I packed my bags and left behind the long cold winter of 2014 on the east coast. When I landed in San Antonio, Texas it was in the 50’s — what? The weather channel said mid-70’s to 80’s was normal. I was confident the next day would be better. Boy, I was wrong. Cold and rainy for the first day of golf on the Palmer Course. The starter said the Palmer Course was a hard course but my playing partners and I all felt it wasn’t bad considering it was rainy and cold. We played better than anticipated given it was the first round of the season. At the end of the day, we didn’t have a drink at the 19th hole to talk about how much fun we had during our round of golf. Nope. All anyone wanted to do was go back to their own hotel room and take a hot shower to try and warm their bones. 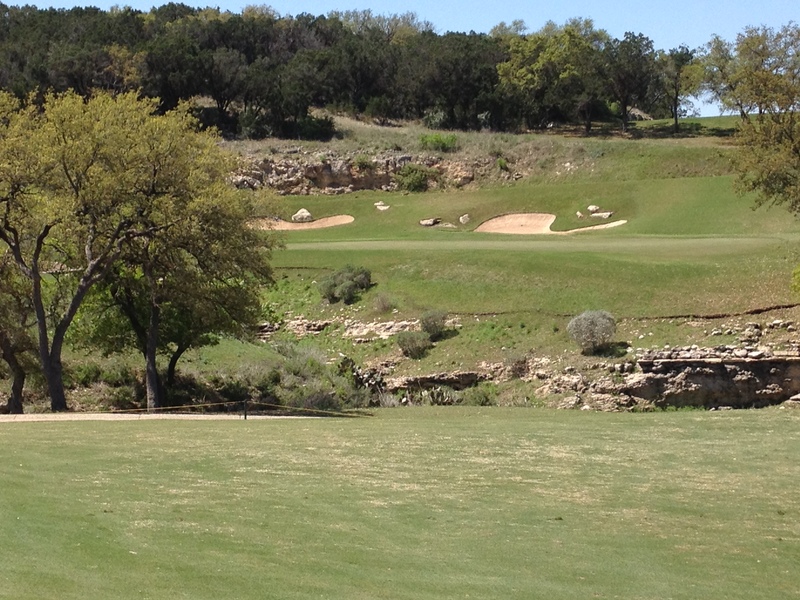 A few days later it was a bit warmer and The Resort Course, at La Cantera was the site of a 2-person scramble. By now I had a “wicked bad” (for all my New England friends) cold with a fever and sore throat. The morning was still cold by was sunny; and everyone said it would warm-up. Again, the starter said The Resort Course was a hard course. The PGA Tour played the Texas Open on the Resort Course from 1995 to 2009. 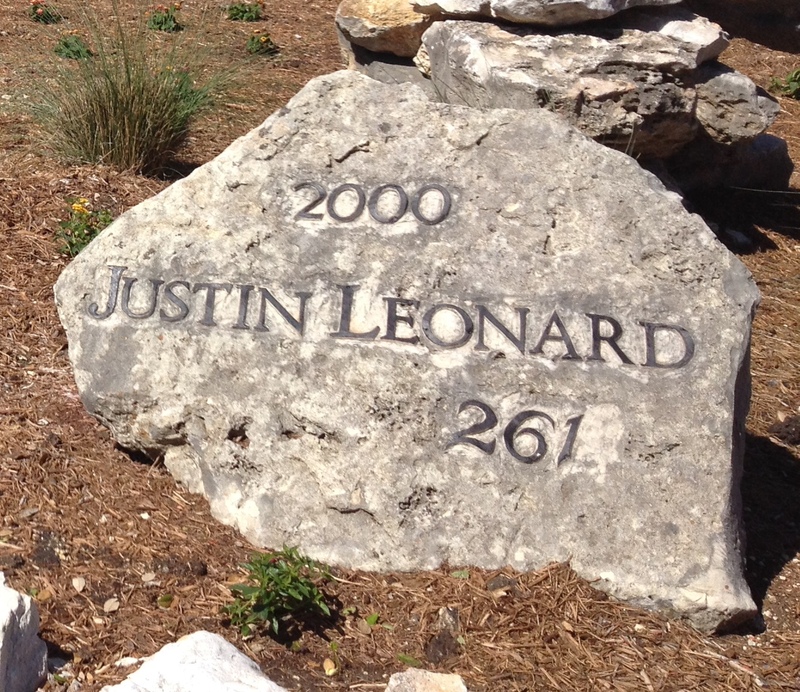 At the turn, there are stones engraved with winner’s names from the tournament. All the women that I played with felt the course was very long for us (even from the forward tees) but it was also a very windy day and a lot of times we were hitting into the wind. I am not the longest hitter off the tee but my second shots and short game fit nicely with my partner, who did hit it long of the tee. I love the internet today because you can see a whole course, hole by hole. The Resort Course has a good 360 view. There are two holes that I had memorable shots on — Number 5 and number 12. Hole 5 is a 432 Par 5 with a dogleg to the right for the approach shot (or over the trees to the green). My partner said she did not have “the shot in her bag to go over the trees” but I felt I could do it. My pro had shown me how to do that shot last summer. Well, I am proud to say I did it! I grabbed my 4 hybrid, put the ball slightly forward in my stance, a slight forward press in my hands and my swing thought was to swing down on the ball. I watched my ball sail over the trees. When we got to the green (130 yards away) there was my ball. All golfers know it takes just one great shot during a so/so or bad round that makes a golfer want to keep playing. That was the shot of the day for me. I was so excited I forgot to take a photo! The other fun shot was on the 12th hole, a par 288 yard par 4. The approach shot onto the green is over a hazard. I think the course designer wanted a visual that would intimidate golfers (you know, get in your head — “ugh, I have to carry that stuff?”) Below is the view of the shot I had to make it onto the green. The flag is hard to see but sits just to the right of the trees in front of the bunker on the left. All my playing partners missed the green (short and in the junk). It really surprised me because they all had great shots until this approach shot. I hit my ball onto the green and was very happy. My partner said that I was “smart” because I went for the shorter distance over the junk by going for the middle-right side of the green. They all went for the flag. Another shot that made me feel good about my game. That’s the trick, think only about your good shots. We had a fun time and to my surprise my team came in 2nd place in the 2-person scramble, high handicap flight. Did I forget to mention I am a high handicap. It is hard to be a low handicap when you can’t drive the hole in regulation (but I am working on my length.) I learned something about my game in that scramble. I may be a high handicap but I am a great scramble partner because I have a good short game and sometimes hit great approach shots. The bottom line — La Canter Resort is beautiful, the courses are hard but not so hard that you shouldn’t give them a try if you are in San Antonio. The yardage on the scorecard is deceiving because the front tees seem to be reasonable. But what makes it long for ladies is the wind and some of the carries. My only advice – just don’t get my luck and have the weather be cold and rainy because you might come away with another experience — a “wicked bad” cold. 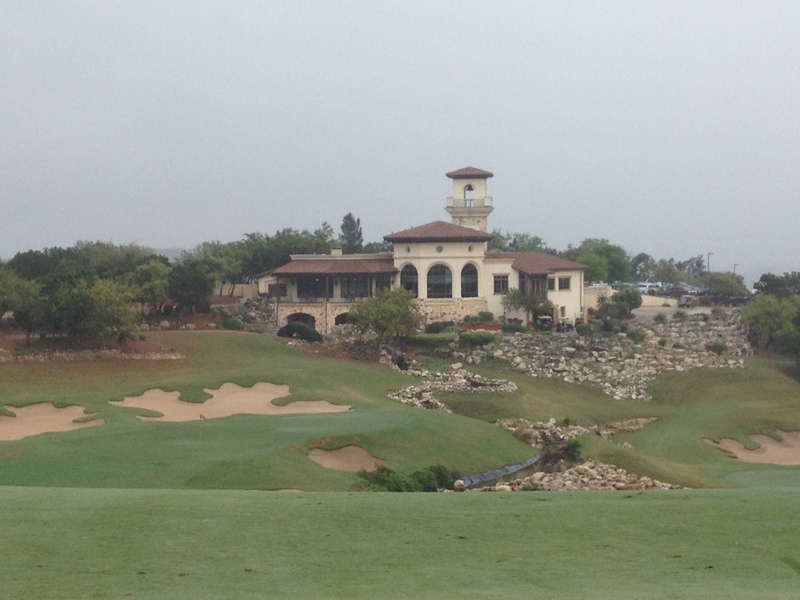 This entry was posted in Course Review, Gof Course and tagged Golf, golf course review, La Cantera golf courses, Palmer Course, San Antonio, Texas, The Resort Course, The Resort Course at La Cantera Golf Club by C. Baker. Bookmark the permalink.